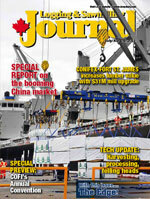 Recently, the Canadian media has widely covered the impressive growth of Canadian lumber exports to China. This good news story has emerged at a time when our lumber industry needed good news. The reasons behind this export growth are worth exploring, as is the question whether our market position is sustainable and still has room to grow. In May 2011, British Columbia’s SPF lumber exports to China in value terms surpassed lumber exports to the United States for the first time. Although this may not indicate that China will permanently replace the U.S. as our biggest offshore market for SPF, it does mean that the China market is a real, critical strategic component for our industry. For the first five months of 2011, SPF lumber exports to China reached 2.8 million cubic metres, double the 2010 level for a similar period. When Canada Wood and Forestry Innovation Investment (FII) first established a presence in China in 2002/2003, we were in sixth position for SPF imports to China, even behind Germany. Last year, China surpassed Japan as Canada’s second largest SPF market in both volume and value terms and also surpassed Russia as the largest supplier of SPF lumber. The bulk of our SPF lumber to China, economy and utility grade, is used in China’s massive construction industry for concrete forming. Although this is a good market for our lower end grades of lumber, Canada Wood and FII’s main focus is to grow the market for structural grade 2 and better for wood frame construction (WFC). This is a long-term project for us but we are starting to see some positive results from these efforts. The construction grades reached almost 40 per cent of our total SPF sales to China in 2010, up from 19 per cent in 2009, although still only single digits of SPF are used in structural WFC applications. WFC housing starts are not tracked in China, but we currently estimate that 20,000 WFC units are in the active planning stage or under construction. This is double what it was one year ago. These numbers underline that while our SPF exports to China is a success story, we have barely penetrated the WFC market. There is still a big opportunity for the growth of our higher grades of lumber. This optimism needs to be balanced by the emerging challenges on the supply side, potential obstacles of port loading capacity, container availability, and eventual requirement for new mills and investments when the U.S. market bounces back. These are “good” issues to face that can be resolved. There are several factors that can be attributed to our growth in lumber exports to China. The strong and focused support from the B.C. Government; Minister Pat Bell of the Ministry of Jobs Tourism and Innovation is a passionate advocate for the potential of the China market and a strong supporter of the efforts of Canada Wood and FII on the ground in China, as well as in Canada. Similarly, Natural Resources Canada, through its funding and program support, has been critical to the ongoing success. The on-the-ground efforts of the Canada Wood/FII team in developing and working with Chinese stakeholders to find in-China solutions for WFC. A good example is wood truss re-roofing for six-storey concrete buildings that are facing leakage and energy loss problems. This is a solution not used in Canada and fairly unique to the Chinese market. WFC systems for villas and resort homes, multi-family use (townhouses), hybrid (concrete and wood), public buildings (schools, seniors homes, club houses, etc. ), and a ground-breaking, four-storey service apartment in Tianjin have also been developed and introduced. The focus and marketing efforts of our industry have been critical to this unique government-industry effort to penetrate the market. The partnership between the Canadian governments and industry, in a Team Canada approach, means CEOs and government representatives travel and work together for the benefit of the industry. The collapse of the U.S. housing market around 2008 with housing starts dropping from 2 million to less than 500,000 a year. 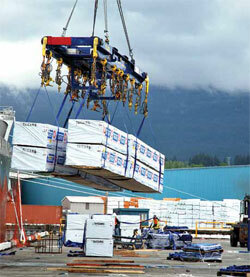 Russian export tax of 25 per cent on logs, implemented in late 2008, makes Canadian lumber very competitive. The stability and quality of Canadian supply, especially compared to the relative instability of Russian supply. The construction boom in China. The key factor to success in the Chinese market for lumber or other products is focus and commitment. The Canadian companies that have benefited in the export growth of SPF lumber to China have demonstrated both in abundance. During a recent trade mission led by Minister Pat Bell, the question of commitment was raised at the government level as well as by one of China’s biggest importers of Canadian SPF, namely “Can we rely on your supply for the long term, when the U.S. market bounces back?” Our companies responded positively and their efforts since have convinced the importers of a stable Canadian supply. Several companies have dedicated production of lines and entire mills to the China market. Presence and continued marketing efforts are also key. In China, “guanxi” or relationships with government and customers are of foremost importance. While this is the case in most markets, the importance of this in China cannot be overstated. This can only be achieved through regular contact and dialogue with Chinese stakeholders. Successful companies have resources in the market working hard not only on making sales, but also on joint ventures, MOUs and developing relationships. Although the market for utility and economy lumber for concrete forming will remain strong into the future, a growing market penetration for structural grades 2 and better lumber for WFC will continue to require expanded efforts by Canada Wood/FII and industry. The WFC industry in China is relatively new and still requires our support to grow. By comparison WFC in the U.S. is already recognized as a good solution for residential and public uses. The messaging of the various benefits of WFC, compared to concrete, brick and mortar, or steel is starting to take root in our three major Chinese stakeholder groups of government, academia and industry (developers, builders, designers). There is, however, still much work to be done in this regard. China wants to be viewed as an environmentally responsible nation and has tasked its Ministry of Housing and Urban-Rural Development (MOHURD) to increase energy efficiency and lower the carbon footprint in its construction sector. These are also the Chinese objectives in the Canada-China Joint Working Committee, established in March 2010, by Canada, B.C. and MOHURD. One of our objectives is to have China’s major developers, most of which are state-owned, seriously consider and get involved in WFC projects. The push from China’s government on this environmental front has been a positive factor for further involvement, as well as their experience in previous WFC projects that involved Canada Wood’s technical expertise. The other major difference between the U.S. and China markets for WFC is the ongoing requirement for technical transfer, through Canada Wood’s quality assurance program, educational programs, and training programs of Canada Wood College (for builders and designers). After several years of a “push” strategy of trying to convince Chinese stakeholders of the need and benefits of WFC, we now find ourselves in a “market pull” situation, with the market determining the projects. This is a major milestone, but it also means builders with no wood experience are entering the market. There is a dearth of quality carpenters and builders. Similarly, there is a dearth of WFC design capacity in China, as well as the Chinese software required for advancing WFC design. The Canada Wood/FII team is working on both of these challenges and it will remain a priority. The Canada Wood and FII team in the field firmly believe that our current market position in China for SPF is not only sustainable but has significant room for growth. The number of WFC housing starts in China is still miniscule by global standards but we have seen these double year-on-year for the last three years. Our efforts combined with the Chinese government’s policy on reducing carbon footprint and increasing energy efficiency in the construction sector is starting to have impact. Chinese developers are now driving the WFC market, i.e. we are in a “pull” situation after several years of a “push” market strategy. It will be very important, as we move forward, to enhance our focus in helping our Chinese stakeholders build its WFC capacity through our training and quality assurance programs. B.C. lumber shipments to China in May 2011 were the largest monthly volumes ever, reaching 746,000 cubic metres of softwood lumber. This was up 157 per cent by volume over the same month last year (172 per cent by value). The value of B.C.’s softwood lumber exports to all Asian destinations in the first five months of 2011 was $776 million, or 49.5 per cent of the total value of lumber exports year-to-date. The value of B.C.’s softwood lumber exports to the U.S. in the first five months of 2011 was $661 million or 42 per cent of the total value of lumber exports year-to-date. B.C.’s softwood lumber exports to China (including Hong Kong) of 2.8 million cubic metres from January to May are the equivalent of approximately 76,000 containers measured in 20-foot equivalent units or “TEUs” (Twenty-foot Equivalent Unit). During the same five-month period in 2010, B.C. sales to Asia amounted to $464 million (32 per cent of total lumber exports), while shipments to the U.S. were $815 million (58 per cent of total sales). Most regional lumbermen converging on Prince George for their annual Council of Forest Industries convention in the spring of 1975 were in a pretty sombre mood given the slumping levels of their respective businesses. The members of COFI’s Northern Interior Lumber Sector (NILS), as it was then called, had endured a couple of tough years. The experts and commentators called it a recession or depression and the worst in 30 years. 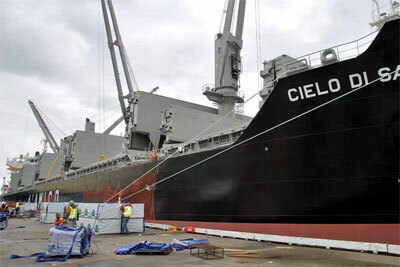 About 85 per cent of the NILS members’ total lumber production was destined for the U.S. But the market was in the tank while other operating costs were rising. The experts and commentators were predicting a high of 1.6 million housing starts by the end of 1975. Canada’s share of the U.S. lumber market was around 21 per cent, up from about 16 per cent in 1968. Japan, on the other hand, was registering around 2.8 million housing starts annually and the rate was increasing. Some NILS member companies had been seriously looking at the Japanese market since the early 1970s and promoting the use of SPF platform frame construction. In contrast, the B.C. coastal forest company MacMillan Bloedel began selling wood products into the Japanese market around 1923. In 2011, it’s estimated about 70 per cent of the regional COFI membership mills lumber production is marketed in the U.S.
And a revealing fact from the summer of 2011. In May, for the first time, Chinese buyers paid more for B.C. softwood lumber exports than their counterparts in the U.S., according to B.C. Stats figures.